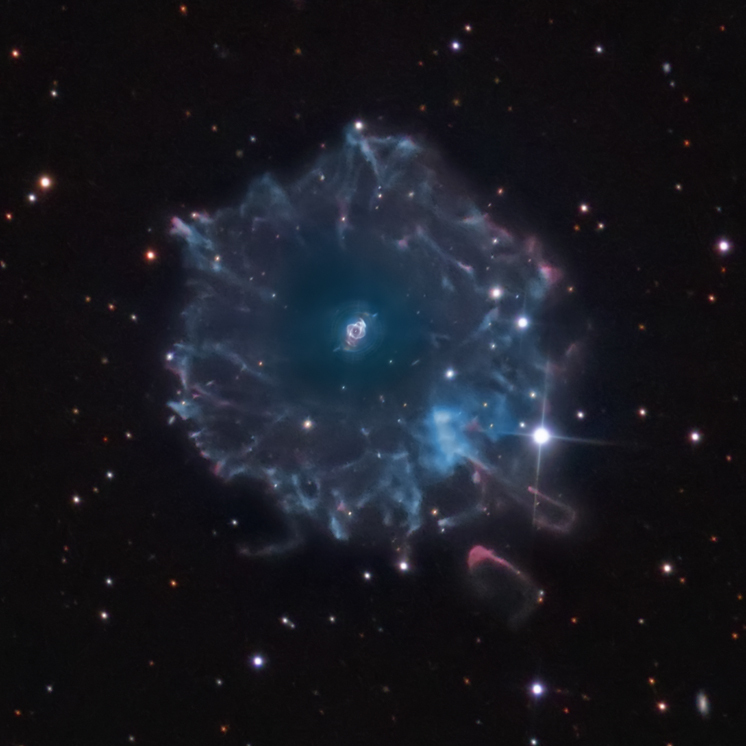 The Cat’s Eye Nebula (NGC 6543) is a bright 11 arcmin planetary nebula in the Constellation of Draco at RA 17h 58m 33s and DEC +66m 38d 01s. It represents a late stage in the evolution of a star with less than 8 solar mass. Its outer envelope has been expelled, leaving a hot white star that ionizes the expelled gaseous envelope, causing it to glow. Eventually the nebula disappears as the central star cools and becomes a white dwarf. The envelope of the Cat’s Eye glows more strongly from the emission of blue-green oxygen (OIII), but also has emissions of mostly red hydrogen (H-alpha) and nitrogen (NII), as well as others. 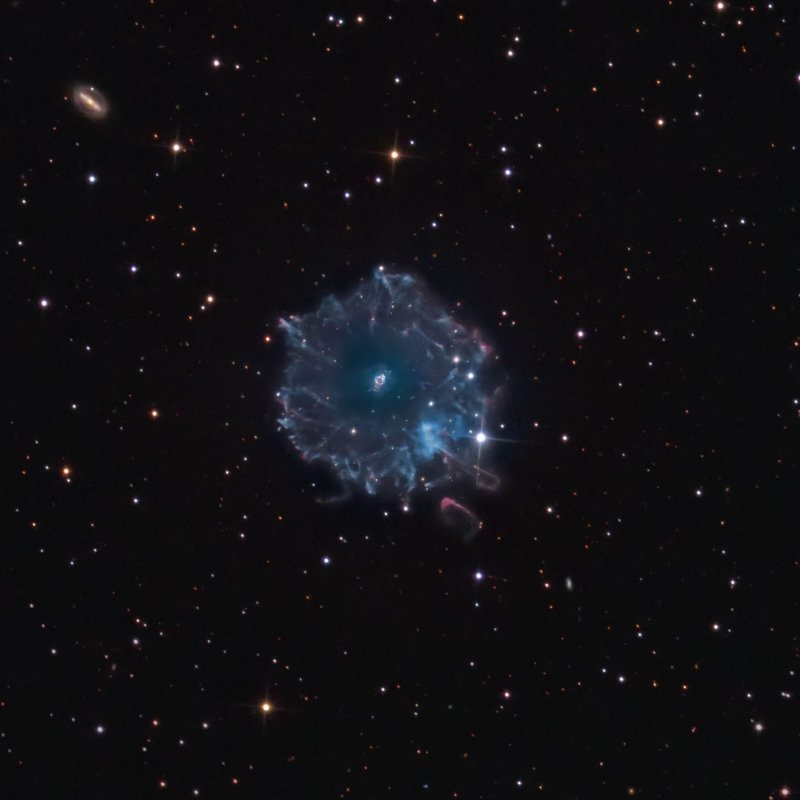 The Cat’s Eye is a difficult object to process, requiring the combination of short and long exposures. As such it is similar to processing the very bright Trapezium in the Great Orion Nebula. The RGB broadband, deep H-a and OIII narrowband data came from a 16” RC telescope with a plate scale of 0.53”/pixel. Additional data from the 32” Schulman RC telescope (0.33”/pixel) at the University of Arizona’s Mt. Lemmon Sky Center was kindly provided by Mr. Adam Block. These included 6 minutes of 30 s exposures from an Astrodon Clear filter (UV-Blocked, No NIR blocking), 8 minutes of 30 s exposures from an Astrodon 5 nm H-a filter, and 3 hours of 10 min exposures from the Clear filter. The data at Mt. Lemmon were taken with an SBIG STX16803. The short exposures from the 32” telescope were used to bring out detail of the loops in the core and the surrounding concentric rings so that they could be blended into the wider field and deeper narrowband data from the 16” telescope. North is toward the upper right. The field is 17.8’ x 17.8’. The 13.8 mag barred spiral galaxy is NGC 6552 in the upper left region of the image (east).